From the book, "Brewing Beer In The Buckeye State, Volume I" by Dr. Robert A. Musson. Consumers Brewing Co. was an unusual entity in Ohio: a brewery beginning operations in the 1890s. It began as one of the state's earliest stock company breweries, incorporated on April 8, 1897, with a capital stock of $20,000, which was later raised to $75,000. The company chose an old factory building at First and Locust Streets to establish its brewing operation (the official address was 75 E. Locust Street). This had previously been occupied by the Blandy Machine Works, and the structure dated back to the mid-1860s. It was purchased by the new company for $8,100, and was soon renovated into a brewery with modern equipment and cellars capable of storing 18,000 barrels. The first batch of "Newark Beer" was for sale on the local market by May, 1898. Charles Andre was the company's first president and plant manager. Born in Hesse-Cassel, Germany, in 1846, Andre had already worked as a brewer's apprentice before emigrating to the United States in 1862. He served in the Union army during the Civil War, then worked in numerous breweries over the years, including eighteen years with the large Born & Company brewery in Columbus, Ohio. Herbert R. Gill was the new company's secretary. Other initial directors included Julius A. Kremer, E. Kremer, and A. W. Gill. Herbert Gill left the company in 1901 and moved fifty miles east to form the short-lived Cambridge Brewing Co. His place as secretary was taken by Julius Kremer, a native of Dinslaken, Rheinpreussen, Germany, who also was born in 1846. His education and training were in architecture, which he undertook upon coming to America in 1869. He supervised the construction of the Born & Co. brewery in Columbus, where he worked with Andre, and it was here that they first planned the formation of their own brewing concern. The company initially used city water for the brewing process, although deep wells were drilled in 1900 for a new and presumably purer water source. Upon opening, the brewery had an annual capacity of 30,000 barrels, entirely of lager beer. Their goal was to sell 10,000 barrels in their first year, a goal that was nearly realized, and business steadily grew from there. The company's sales increased significantly in 1903 due to a strike by brewery workers in Columbus, which temporarily shut down all of that city's brewing operations. 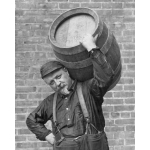 By 1905, Consumers was selling 23,000 barrels annually. Natural ice was fairly scarce in the region at this time, and most ice had to be shipped in from Zanesville. To eliminate this cost, Consumers built its own ice house on the premises in 1901. Sales of distilled "crystal ice", at $2.00 per ton, were very successful, and the company increased its capital stock to $150,000 in 1907. Soon after this, the company purchased two delivery trucks for home sales of both beer and ice. These were thought to be the first delivery trucks in use in the city. Andre and Kremer continued to oversee the company throughout this era. Harry W. Rossel, who had joined the company at its beginning as a sales agent, had risen to the position of vice-president and general manager by 1914, when he died of blood poisoning following a leg injury. Henry J. Schneidt was hired as plant superintendent soon after this. Production of Consumers Special and Extra Pale Lagers, which had been introduced primarily as bottled beers for home sales, continued successfully over the next decade. A new addition to the focus on home sales by this time was an attempt to target women as potential customers. One advertisement from 1918 stated: " �Everywhere I go my friends serve Consumers Beer. If I look into their ice boxes I find a row of shining bottles; when I make an afternoon call, they welcome me with appetizing sandwiches and Consumers. If I am invited out to dinner I am quite apt to find this popular beer served with the meal. Many of my friends consider that their day is not happily completed until after a late supper, a steaming rarebit or a cheese and cracker luncheon, and a bottle of their favorite brew.� The experience of this one woman simply shows the ever-growing popularity of Consumers Beer." At the close of 1918, statewide Prohibition had forced beer production to cease, and the uncertainty of the times was reflected in the brewery's 1919 advertising calendar, which stated, "Accept this calendar as a token of our appreciation of your past good will and patronage. What the future will bring to us is uncertain. Our investment is too large to lie idle, so we bespeak, as far as is consistently possible, a continuation of this good will and patronage." When all alcohol sales stopped the following May, the company reorganized as the Consumers Products Co., as producers of Consumers New Special Cereal Beverage, as well as Lemon and Lime, Grape, Cherry, Strawberry, and Raspberry Sodas, Glee Club Ginger Ale, Whistle Orange Soda, and Dr. Swett's Root Beer. Andre and Kremer retired soon after this, and Schneidt became president of the new company, with Harry W. Rossel, Jr. as secretary. Production of non-alcoholic beverages continued until approximately 1930, after which the old brewery closed its doors and the remaining equipment was liquidated. With the repeal of Prohibition three years later, a new company was organized to return the brewing of beer to Newark for another twenty years. » Read more about this and other Ohio breweries in Dr. Robert A. Musson's book, "Brewing Beer In The Buckeye State, Volume I: A History of the Brewing Industry in Eastern Ohio from 1808 to 2004."